Last Friday, for the first time, an Incentive Awards Luncheon was held by the Bowditch PTSA in honor of the 45 Bowditch students who received Incentive Awards for the 1st Quarter of the 2018 - 2019 school year. 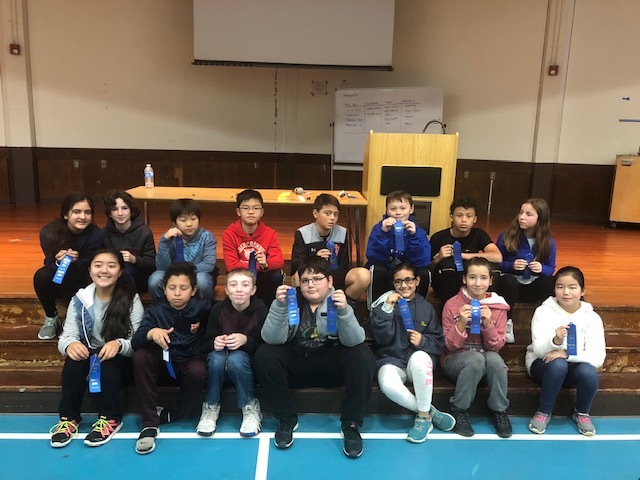 Incentive Awards are given quarterly to students who exhibit commendable behavior, enhancing the overall quality of life at Bowditch – either through outstanding personal progress or contributions to the classroom and/or campus experience. Some examples of character traits valued: working hard to improve in class, participating in the classroom in a noteworthy way, helping a teacher or fellow student in some way, contributing to a greater sense of school spirit and pride, and seeing a need and filling it. We had a little bit of song & dance and quite a lot of pizza, dessert & fun! The Bowditch PTSA is proud of these 45 students and looks forward to sponsoring similar luncheons at the end of the 2nd & 3rd Quarters. Information about the San Mateo Unified High School District's parent information night and shadowing information can be found on their website. The high school district has provided multiple shadowing dates so students can attend without disruption to your current school schedule. Please make all efforts to avoid missing school days at Bowditch. Any shadow days that result in missing school will be considered an unexcused absence. Our school utilizes the SchoolMessenger system to deliver text messages, straight to your mobile phone with important information about events, school closings, safety alerts and more. You can participate in this service by sending a text message of "Y" or "Yes to our school's short code number, 67587. You can also opt out of these messages at any time by replying to a message with "Stop". SchoolMessenger is compliant with the Student Privacy Pledge, so you can rest assured that your information is safe and will never be given or sold to anyone.